After numerous international awards last year and the successful completion of relevant certification procedures, ecsec GmbH was distinguished last night for “SkIDentity – Mobile eID as a Service” with the renowned Bavarian Innovation Award 2016. The award, which was handed over by the Bavarian Minister of Economic Affairs, Ilse Aigner, together with the President of the Bavarian Chamber of Industry and Commerce, Dr. Eberhard Sasse, and the President of the Bavarian Chamber of Crafts, Georg Schlagbauer, marks the start of the “BayernID” initiative – the digitization campaign of the Bavarian economy based on trustworthy identities. Bavaria’s Minister of Economic Affairs, Ilse Aigner, together with the President of the Bavarian Chamber of Commerce and Industry, Dr. Eberhard Sasse, and the President of the Bavarian Chamber of Crafts Georg Schlagbauer, yesterday awarded the Bavarian Innovation Award 2016, in a solemn setting in the dignified hall of the German Museum in Munich. Among a total of 187 nominated companies, ecsec GmbH has been awarded for its “SkIDentity – Mobile eID as a Service” offering. “I congratulate the company ecsec GmbH on the award of the Bavarian Innovation Award 2016. By transforming electronic identity documents eID into secure and mobile ‘Cloud Identities’, which can easily be used in any cloud and web application for privacy friendly authentication, ecsec has made an important contribution to a secure and user-friendly networked world. It is also an essential prerequisite for a successful digitalization of the economy and society”, commented Ilse Aigner, Bavaria’s Minister of Economic Affairs. The distinguished SkIDentity Service supports, among other identification means the German electronic identity card (Personalausweis), the Austrian social security card (e-card), the Estonian identity card and e-Residency ID, as well as various signature and banking cards for the secure implementation of electronic business processes. The certificate for the SkIDentity Service according to the “Trusted Cloud Data Protection Profile for Cloud Services” (TCDP) with the highest protection class III issued by the certification body of TÜV Informationstechnik GmbH (TÜViT) and the certification of the “Secure Cloud Infrastructure (SkIDentity)” according to ISO 27001 based on IT-Baseline Protection by the Federal Office for Information Security (BSI-IGZ-250), proof that even the highest standards with respect to privacy and data security are fulfilled within the SkIDentity Service. Theelectronic ID card has been successfully used in Bavaria for the digitization of administrative processes for quite some time now. Since 1st of July 2016, the eIDAS-regulation on electronic identification and trust services for electronic transactions in the European Single Market has been fully applicable. In addition, the Free State of Bavaria promotes the secure digitalization of business processes in small and medium-sized Bavarian companies with the “Digitalbonus.Bayern” program. Against this background, leading Bavarian technology providers, consulting companies and digitalization experts from selected chambers of industry and commerce have joined forces in order to create the “BayernID” package (http://BayernID.de), which is an integrated service package for the intelligent digitalization of business processes in Bavarian companies. This package includes expert and non-committal advice on general digitalization measures and aspects of IT security, demonstrates the opportunities inherent in the eIDAS regulation and provides trusted identities, as well as other cloud and trust services, at preferential terms. 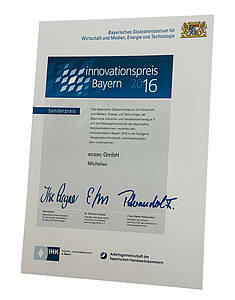 In addition to ecsec GmbH, which has been awarded with the “Bavarian Innovation Award 2016”, the “BayernID” initiative is supported by the internationally leading technology group Giesecke & Devrient GmbH, the Fraunhofer Institute for Industrial Engineering (IAO), SiXFORM GmbH, Urospace GmbH, the buergerservice.org association, which is especially active in Bavaria to promote the use of the German eID card, the IT-Cluster association for Upper Franconia, the Institute of Information Systems at Hof University, the Munich-based provider of the iDGARD-Service Uniscon GmbH as well as the chambers for industry and commerce for Würzburg-Schweinfurt and Bayreuth. Furthermore the initiative is open for further partners who want to contribute to the digitalization of the Bavarian economy. The Munich-based non-profit association buergerservice.org e.V. supports the “BayernID” initiative with the SID-Box (Secure Identity-Box) developed by the association. With the aid of the SID-Box, a citizen terminal (digital service point) can be produced with the least effort, for the direct use of the online ID function of the German eID. Companies, institutions and authorities are thus in a position to provide access to the German eID card to all persons in their environment (employees, customers, members, etc.) in a very simple way. The first digital service points are currently being set up in co-operation between municipalities, chambers of industry and commerce and the buergerservice.org association in the city of Ansbach and in the district of Würzburg.